Anderson was chosen by the Falcons in the seventh round of the 1994 NFL draft and was strictly a backup during his first two seasons who also returned kickoffs in ’95. He broke out in 1996, beating out Craig Heyward, the starter for the previous two seasons, and gaining 1528 yards from scrimmage, with 1055 yards on 232 carries and 473 yards on 49 catches. A powerful runner and at his best between the tackles, he also could be graceful and had the ability to burst to the outside. Anderson was hindered by an ankle sprain in ’97 but still rushed for 1002 yards and caught 29 passes for another 284 yards. Falcons went 14-2 to finish first in the NFC West. Won NFC Divisional playoff over San Francisco 49ers (20-18) and NFC Championship over Minnesota Vikings (30-27). Lost Super Bowl to Denver Broncos (34-19). 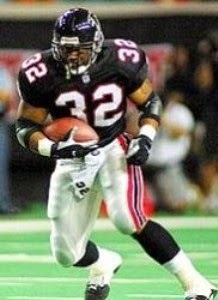 After setting a NFL record for rushing attempts in 1998, Anderson’s 1999 season ended in the second game with a knee injury that required surgery. He came back in 2000 and, following a slow start, rushed for 1024 yards and caught 42 passes for another 382 yards. However, another major knee injury in 2001 proved to be career-ending. Overall, Anderson rushed for 5336 yards on 1329 carries (4.0 avg.) and caught 156 passes for 1645 yards (10.5 avg. ), scoring a total of 41 touchdowns (34 rushing, 7 receiving).